Where I'm from, pies that don't have crème pâtissière in them have a crust that is called brisée or half cookie crust half butter flaky crust. It's my favorite kind and is perfect for fruits. FA Cookie/CAP Sugar Cookie/CAP Golden Butter form the cookie buttery crust. In France we don't use graham crackers at all, so we don't have graham cracker crusts. This crust is a little less defined but you will definitely taste a smooth buttery cookie. FLV Sweet Dough/TPA Brown Sugar is here to add a little gooey at the bottom of the pie where you add a little semolina and brown sugar to absorb the cooking juices of the baking fruits. 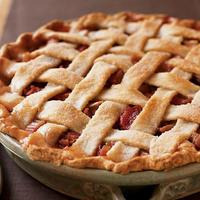 WF Sweet and Sour Rhubarb/WF Bumbleberry/FLV Cream are the fruit mix of this pie. The rhubarb is actually a little sour and bumbleberry does taste like a very dark but vibrant mix of berries. The cream is here to round it all up and add some body and sweetness. Enjoy, be queer and vape on ! This recipe is the property of QueerYourVape and released under the CC Attribution-NonCommercial-Sharealike 4.0 license. You may not copy, derive or commercialize this recipe without following the terms of this license or the explicit permission of the creator.